Marcia was born in Wisconsin and moved to Dayton, Ohio as a child. She developed an interest in art early on and received a B.A. degree in Art Education at Mount St Joseph College in Cincinnati, Ohio. 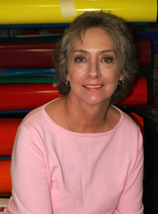 Marcia has been in the exhibit/display/sign industry in Florida for over 10 plus years. Prior to coming to Florida, Marcia was an art teacher in Cincinnati. She is another of our great designers, with a particular eye for detail and quality. Marcia loves cats, she has five! And she also loves golf!